Carrasco got the support from Kyreek Gardner who went 3-for-3 in the opening game in leading Bregardo Flax past Willard Wheatley, 18-2. D’Andre Baijanuth took the loss. T’Khoi Richardson and Jahdique Winchester also had hits for Bregado Flax and while Johan Mannez and Courtney Palmer, were 1-for-1 for Willard Wheatley. Carrasco then pitched Bregado Flax to an 11-0 shut out of Ivan Dawson. Makay Jones was the losing pitcher. Flax’s Mordecai Fontaine was 2-for-2 as the top hitter while Gervis James of Ivan Dawson went 1-for-1. Next for Carassco came a 2-0 shut out of Francis Lettsome, before a 3-2 victory over Althea Scatliffe. Carracso also enjoyed a 3-2 victory over Jost Van Dyke, as they completed the tournament unbeaten. Althea Scatliffe finished second with a 3-2 record. Stephen Emmanuel went 2-for-2 to back the pitching of Javin Wattley during a 6-1 triumph over Willard Wheatley. T’Coy Tyson was the losing pitcher. 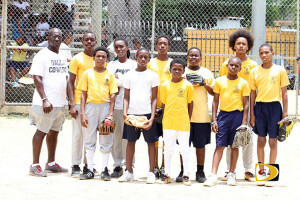 Wattley was again on the mound as Althea Scatliffe shut down Ivan Dawson, 3-0. They also shut out Jost Van Dyke, 3-0 behind Wattley, before falling to Francis Lettsome, 2-1, for Wattley’s second loss. Jost Van Dyke placed third after Tristan Palmer homered in his only at bat, helping them to a 1-0 triumph over Francis Lettsome. Beyonce Callwood collected the victory. Callwood was again the winning pitcher when Jost Van Dyke turned back Willard Wheatley, 3-2. Callwood got her third victory after they beat Ivan Dawson, 4-2.